One of my favorite astronomers from my youth turns out to have had a connection to Oswald Veblen. John Irwin was a colleague of my father's who loved kids and hiking as much as he loved astronomy. 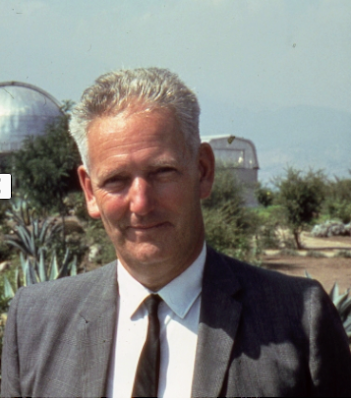 He'd stop by Yerkes Observatory for American Astronomical Society meetings, and my older sister remembers him getting down on his hands and knees in the living room of the director's house and giving her a horse ride. As a kid growing up around astronomers, you remember those few that would come down to your level, and John was one of those who would literally do that. I remember him from family visits to Chile in the mid-1960s, where he was living with his wife on top of the next mountain over from Tololo, where my father would have observing runs. (Note: In reading recently a bio of the well-known popularizer of astronomy, Neil deGrasse Tyson, I noticed that he did his graduate observing at Tololo.) John was doing the site surveying work that lays the groundwork, so to speak, for siting new observatories in the northern Chilean desert--one of the best places in the world to do astronomy. One of the mountains he explored, Las Campanas, would two decades later be the site for the Magellan telescopes--my father's last design project. One thing observatories in the desert need is a water supply, and one day John took my brother and me on a hike down the mountain to check the flow in the creek from which Tololo drew its water. We were hiking down a steep slope when I lost my footing and did what must have looked like a wild improvisatory dance as I slid down the mountainside, trying to break my momentum. When I finally came to a stop, unscathed, he congratulated me on my footwork. That sort of compliment means a lot to a kid, and it's always stayed with me. He told us about a mountain that had many false summits, that is, the climber would look up and think the summit close at hand, only to discover that the mountain continues up and there is much hiking still to do. A climber, tight against the mountainside with limited view of what's above, can be fooled multiple times before finally reaching the top. That story has come to resonate with life and work in general. John loved mountains so much that he celebrated his 85th birthday by climbing his favorite mountain, Mount Whitney, in the Sierra Nevadas of California. His father's family was from Philadelphia, and claimed Ben Franklin as an ancestor. Along with his Veblenesque combining of intellect and a love of the outdoors, John has a familial connection to Princeton and its math department. He was born in Princeton in 1909, while his mathematician father, Frank Irwin, was serving an instructorship from 1908-11, alongside Veblen, who had arrived three years earlier. Both were hired by Henry Fine, for whom the PU mathematics building is named. As a young man, John lived for awhile in Iowa City, Veblen's home town, and was one of the first astronomers to write, back in 1948, about the potential of the early computers that Veblen had done so much to bring into being. During one of those visits to the mountains of Chile in the mid-1960s, my family drove one evening over to the mountain where John and his wife had their house. After dinner we played Hearts. I'm guessing it was his favorite card game, and quickly became ours. "I smell smoke," John would say ominously, when he surmised that someone was trying to flush the queen of spades. Other things John liked to say were "Much grass, poor flavor"--his comic play on the Spanish "muchas gracias, por favor"--and "We're off in a pile of monkey vomit," spoken with mock grandness at the beginning of a journey, lest we take human enterprise too seriously. At some point that evening, I went outside and walked to the edge of the mountain, maneuvering around boulders and the droppings of goats. At the edge, lit by a deep universe of stars and moon, was a frozen ocean, extending out as far as I could see. It was the top of the massive cloud of fog that would move inland each night from the Pacific coast, bringing moisture to the desert. I wish everyone could have such vistas growing up, where the landscape draws your eye to look farther and farther into the distance, with the quality of the air the only limit. Maybe, with vistas like that to open up our minds and expand our thinking, we might take better care of that thin skin of air that comprises the earth's atmosphere, and take more of an interest in what lies ahead. John Henry Barrows Irwin completed his itinerant astronomical career at Kean University, halfway between where his father grew up in Englewood, NJ, and his birthplace in Princeton. For retirement, he moved with his wife to Tucson, where he spent his last 20 years, climbing mountains.